Many theories are swirling around the Enron chief's death ... all wrong. NEW YORK (CNNMoney.com) -- Is Ken Lay, a Fortune 500 power broker who rubbed shoulders with world leaders and the jet set elite, really dead? 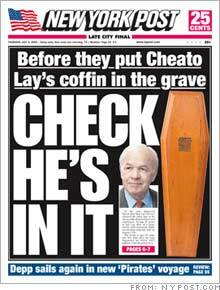 As the New York Post observes, once a cheater always a cheater. "It's the CIA," said one mysterious caller to CNNMoney.com. "There [must] be proof beyond any doubt that Ken Lay is dead and there is not a double being used so that Ken Lay can hide somewhere with the money he stole," wrote a reader. "Make sure somebody in the press sees a body," added another reader. There are several theories. The general idea is that Lay faked his death and is now living somewhere south of the border ... no doubt partying with Elvis. How could he pull off such a feat? Well, he was a one-time friend of President Bush. Even raised campaign funds for him. So either through friendship or even blackmail, then, the government helped. Or perhaps Lay is dead ... but not from a heart attack, as the local coroner said. Maybe the CIA used one of its fancy poisons -- you know, the untraceable kind -- to keep Lay from embarrassing the President. Or Lay used a poison himself to keep from suffering the indignity of prison. A sort of Samurai send off. After all, his whole family was with him at the end. (That Fourth of July holiday thing was just a cover). How does the song go? "Lunatic fringe, I know you're out there ..." Conspiracy theories tend to pop up when there is dissatisfaction and disappointment. And that's the case here. People cheered when Lay was found guilty of conspiracy and fraud. After all his actions, or inactions, wrecked lives. And after four long years the high and mighty chief executive was finally going to get what was coming to him. Now that's not going to happen. Justice is cheated. There must be something to blame besides ... fate? And so people grab at any idea that seems to provide some sort of twisted closure. The Bush connection is particularly attractive (Funny. If you mention Bush in a Lay story, you are tagged with Liberal Bias, but if you leave him out you are accused of Right Wing Bias). And, of course, Lay's final rep was as a cheat ... so why wouldn't he keep on cheating? As many a "Twilight Zone" episode has noted, you don't cheat death. The only conspiracy here is the human scheme to have life make sense. You can only hope that we've learned something and perhaps have a little sympathy for the family. But did you notice how fast that autopsy took place?